Results: Your high school science experiments were fun, smelly, and perhaps even offered a peek into the impossible possibilities of science, but they couldn't have prepared you for the direction science is taking. A new biology—one that integrates the expertise of chemists, physicists, computer scientists, engineers, and mathematicians—is being called for to help solve some of the thorniest energy, environmental, and climate challenges facing the United States today, according to a new report by the National Research Council. Dr. Tony Janetos, a member of the National Research Council committee that wrote the report, directs the Joint Global Change Research Institute, a partnership between Pacific Northwest National Laboratory and the University of Maryland. According to Janetos, climate change plays a key role in the need for a new biology. "Climate change makes it critical for us to protect the health and productivity of our ecosystems so we can ensure sustainable livelihoods for people," he said. "We need a better understanding of how ecosystems function to maintain their productivity, and the new biology will encourage the technologies needed to advance this understanding." Why it matters: The NRC report calls on the United States to address some of our nation's most pressing problems in the areas of food, environment, energy and health, sectors that in their larger aspects represent 50 percent of the U.S. economy. Launching a new initiative to capitalize on the advances recently made in biology and to accelerate new breakthroughs would go far in solving these problems. For starters, the initiative could be used to meet food security challenges by developing the capacity to quickly adapt plants to any growing conditions. On the energy front, the new biology initiative could speed the development of alternatives to fossil fuels by optimizing systems for turning plant cellulose into biofuel. Method: The report was authored by a committee of 16 experts in the fields of biology, engineering, and computational science. The group was tasked with delineating the scientific and technological advances "that have allowed biologists to integrate biological research findings, collect and interpret vastly increased amounts of data, and predict the behavior of complex biological systems." Biologists are already working successfully in many instances with other scientists and engineers. But for collaborations to take advantage of advances in imaging, high-throughput technologies, and computational science and technology, all of which allow researchers to analyze massive quantities of data, a major new initiative is needed involving multi-disciplinary teams of scientists, the committee concluded. What's next? The authors of the NRC report have briefed Congress, given press conferences, and chaired briefings at the White House and with several of the lead agencies in the executive branch. The report's recommendations may help inform future agency decision-making about research investments. Acknowledgments: Funding for this study was provided by the U.S. Department of Energy, Office of Science; the National Institutes of Health; and the National Science Foundation. Research team: In addition to Janetos, the report was authored by 15 experts in the fields of biology, engineering, and computational science. Dr. Thomas Connelly of DuPont Company and Dr. Phillip Share of Massachusetts Institute of Technology co-chaired the committee. Dr. Keith Yamamoto, University of California, San Francisco, chaired the Board on Life Sciences. 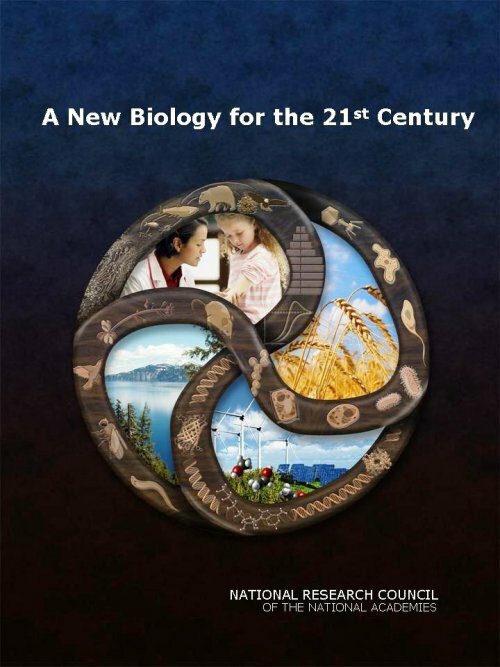 Reference: Committee on a New Biology for the 21st Century. A New Biology for the 21st Century: Ensuring the United States Leads the Coming Biology Revolution. National Academies Press. 2009. Frontiers in Ecology and the Environment, published by the Ecological Society of America, invited Janetos to write an editorial on the subject in its November 2009 edition. (requires a subscription to access).